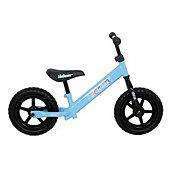 Urban Racers I-Balance bike 12" wheels £18.50 @ Tesco Direct with free home delivery! 12" wheels eh? What speed do they go rotate....33 or 45rpm ? Cold. Doesn't even come with pedals. Colder ...no brakes either! Imagine your child bombing down a hill on one....one way trip I'm thinking! Thanks been after one for my youngest for ages. This will be perfect for him. Thanks been after one for my youngest for ages. This will be perfect for … Thanks been after one for my youngest for ages. This will be perfect for him. Nice, been looking for one of these but they usually cost a lot more. Thanks OP. Learn to balance BEFORE you try a normal bike... then no need to for stabilisers later on! My 3 yr old has a Balance Bike, and has mastered it completely. A great idea for learning to ride! And a bargain too. These are normally £40 to £50 at Halfords. We all learnt on normal bikes when we were kids, why waste £18 just to learn how to balance? We all learnt on normal bikes when we were kids, why waste £18 just to … We all learnt on normal bikes when we were kids, why waste £18 just to learn how to balance? It's easier to start on a balance bike and progress to a normal bike without the need for stabilisers which give a false sense of riding. £18 is hardly going to break the bank and you could easily sell it on for £10+ when you're finished with it (possibly more). Spot the people who don't have kids in this thread! Good find OP. Duly heated, although it's a shame it's with Tesco Direct who are, quite frankly, awful in terms of reliability and after-sales service (in my experience). Spot the people who don't have kids in this thread!Good find OP. Duly … Spot the people who don't have kids in this thread!Good find OP. Duly heated, although it's a shame it's with Tesco Direct who are, quite frankly, awful in terms of reliability and after-sales service (in my experience). Perfect for stepson's birthday, thanks OP! Don't forget TCB... and Tesco Exchange vouchers can be used for this... and you get free delivery..
Gutted, paid full price about 3 weeks ago. Bought it for my son who is 16 months old for christmas. 18 month olds really can use these, I've seen plenty on them! This one is heavier but the basics are the same and I'm surprised they got away with the design due to copyright etc . Easy to put together, the only negative I have is that the tyres / wheels look buckled, however with a bit of arm leverage they soon straighten out. A child who can ride this will never use stabilisers! Wasntme, buy again at the cheaper price & then return with the original receipt - sorted! By the way, for others, Toys R Us have a similar one for £25 & it comes in pink too & they normally have £5 off vouchers or 20% off deals on too. Can anyone that got this confirm if there is a front brake on it? product description says there is. Also what do you think of the bike generally?